A seven-year-old boy and a man have been taken to hospital after being injured in a hit-and-run in Coventry this afternoon. 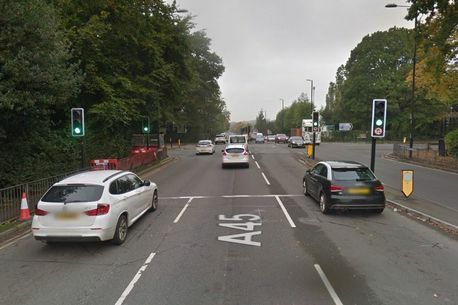 The collision occurred on A45 Fletchamstead Highway near Kenilworth Road at around 4.40pm today (Monday, September 24). Both the boy and man are believed to have injuries which are not serious. West Midlands Police is currently trying to identify a van which is believed to have been involved. Anyone with information is asked to contact the force on 101, quoting log 1789 of 24/9/18. People can also send information to the force via Live Chat at west-midlands.police.uk which runs from 8am to midnight,or contact Crimestoppers anonymously on 0800 555 111. Drivers faced long delays in the area as police closed the major route to deal with the incident. Some said they had been stuck for more than 50 minutes trying to head out towards Leamington. The father of a seven-year-old boy who remains in hospital with a skull fracture after being involved in a hit-and-run yesterday has said the driver "didn't even hit the brakes". Mark Poulton and his son Stephen were crossing the A45 Fletchamstead Highway at the traffic lights near Kenilworth Road when they collided with a small white van at around 4.40pm yesterday afternoon (September 24). Stephen's jaw was broken in two places and his skull fractured in the collision, while Mark suffered a broken ankle. They are both still being cared for at University Hospital Coventry and Warwickshire this morning as police continue the search for the driver of the van believed to have been involved. Mark appealed for people to get in touch with the police if they know anything about the incident. "I want him found," he added. "It was wrong what he did. But it isn't going to change the priority at the moment, which is getting Stephen sorted." He also praised hospital staff who he said had been "really good". Despite being hit, Mark had managed to keep hold of one of his dogs but lost the other - a cocker pug - in the confusion. He thanked residents for searching for him but said he had returned home of his own accord. Police investigating a hit and run in Coventry have released footage of a van they want to trace. Officers want to speak to the driver of this van which is suspected of being involved in the collision on the A45 Fletchamstead Highway on Monday, September 24. I hope the boy and dad recover well, the shock of it alone can kill, in some cases. There should be some speed camera footage of the van , hopefully they get the lunatic driver.